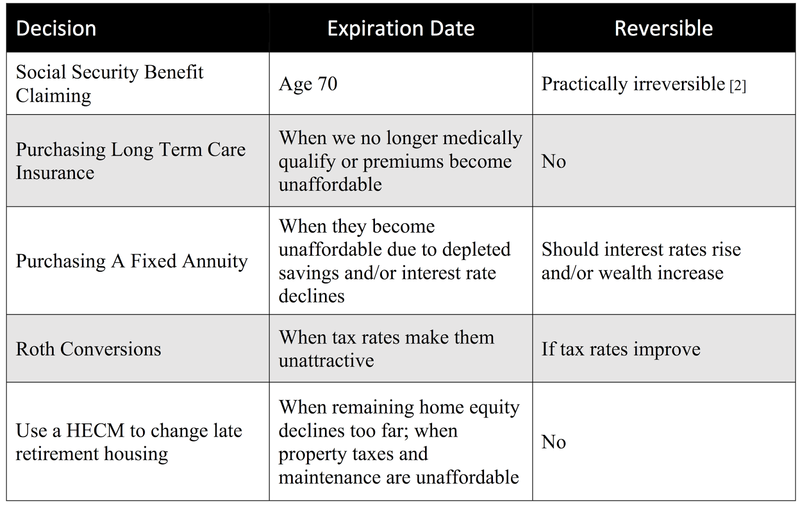 In a series of posts beginning with The Opening, The Middle Game and the Endgame, I mentioned that some retirement decisions have “expiration dates.” Some expiration dates are rigid and regulated while some are fuzzy and more practical. When you develop a retirement plan, it's important to understand when and how these decisions can disappear. Claiming ages for Social Security retirement benefits range under current law from age 62 to age 70. We can delay the decision past age 70 but there is no benefit from doing so – benefits won't increase when we claim after age 70. The expiration dates for this decision are mandated and fixed. In contrast, asset allocation decisions have no expiration date. We can change our asset allocation any time we see fit for as long as we live. In fact, I believe we should update our asset allocation whenever our changing financial situation warrants it. Likewise with spending rates. Other decisions are neither firmly set in statutes or contracts, nor precisely delineated but at some point, they may no longer be available as a result, for example, of deterioration of our health or depletion of our retirement savings. Most insurers set a maximum age for purchasing a fixed annuity but it is typically age 90 or age 95, neither of which is particularly restrictive. A major risk of delaying the purchase of a fixed annuity is that by the time you want to purchase one you may no longer have enough remaining savings to do so. Let's say you plan to live off stock market investments and Social Security benefits until you will purchase a fixed annuity at age 80. Should your investments perform poorly or you overspend from savings, you may find at age 80 that you no longer have enough savings to purchase the amount of annuity income you had hoped. Delaying some retirement decisions too long can take them off the table. Whether it results from lost wealth or increased annuity costs, the expiration date for purchasing a life annuity can become the time when you no longer have enough savings to purchase the amount of annuity you wanted. That expiration date is practical and fuzzy. It can arrive quickly with a bear stock market or precipitous interest rate decline, or it can creep up on you with gradually declining savings because there are two things you cannot predict: how much real future annuity income will cost (i.e., what future interest and inflation rates will be) and how much savings you will have left when you decide to purchase. Milevsky and Young   shows that there is a theoretical optimal age to purchase annuities depending on several factors such as gender and risk aversion and that waiting longer than this age to buy them has negative value. While the 90 to 95 maximum age for some insurers means that the option of buying an annuity can disappear, Milevsky suggests that the value of purchasing a life annuity may begin to decline well before then. Long Term Care Insurance, it seems not widely known, is subject to medical qualification. Conditions that increase the likelihood of a claim will increase premium rates or may leave you unable to purchase coverage, at all. These conditions are not all age-related so some relatively young people may not qualify for LTC insurance. Regardless, as we age we may suddenly develop conditions that exclude its purchase. Tom Morris , a retirement planner and wealth management advisor who also sells LTC insurance, wisely notes that the best time to buy insurance is when you can qualify for it. Purchasing in your 40s or 50s may be the best bet as premiums can start to rise quickly around age 60. His experience was that about half of applications for LTC insurance were denied when applicants were in their mid-to-late 60s. This is a decision you can put off too long. By the time you retire, it might already be too late. The expiration date for LTC Insurance insurability is fuzzy and unpredictable because it depends on our health. As with fixed annuities, there are risks associated with delaying the purchase of LTC insurance and the risks grow with age until purchasing it will eventually no longer be practical. There is no maximum age for obtaining a HECM reverse mortgage (both spouses must be at least 62), but there are reasons you could be denied. Let your house fall into disrepair, for example, and you might need to spend a lot to bring it up to FHA standards. You also need to show that you can afford to maintain the home and pay property taxes. Should your financial situation deteriorate to the point that you can no longer meet these requirements then you might be denied a loan. Similarly, we might be able to use home equity to fund more appropriate housing in late retirement. Retirees who begin spending home equity too early, though, might not have enough equity left to make that decision when the time comes. Lastly, if you have a financial crisis late in retirement you might not only be unable to maintain your home and pay property taxes but also find yourself needing the loan much sooner than you can get one approved. The process is a lot like borrowing a regular mortgage and can take months – not something you want want to do in the middle of a crisis. You may find you have waited too long to borrow a HECM if your wealth has declined too far, your home has fallen into disrepair, or you have an immediate financial emergency. If your goal was to fund late-retirement housing, you may have waited too long if you already spent too much of your current home's equity. If you live in an area with rapidly declining home values, your borrowing capacity is declining along with it. Fortunately, with HECMs, we can financially separate the act of opening a HECM line of credit from spending the money. There's isn't much risk – or cost, if you shop around – to opening the loan. The risks are related to spending equity now that you might need later. There is little risk to deciding to open the loan now and delaying the decision to spend from it and there are benefits, like a growing line of credit, locked-in home valuation, and immediate access to an existing line of credit in the aforementioned crisis. Two tiers of income tax might also limit some retirement options. You might fund early retirement from your savings alone. When you begin receiving Social Security benefits, a portion of them will be taxed (the first tier, up to 50% of your benefits taxed) so your income tax rate may increase. At age 70½, you will need to begin making Required Minimum Distributions (RMDs) from your IRAs and this can push your Social Security tax rate even higher (the so-called “tax torpedo", up to 85% of benefits taxed”). Before receiving Social Security benefits and withdrawing RMDs you may experience a period of very low income tax rates during which it is attractive to use Roth conversions to lower IRA balances, reduce future RMDs and avoid taxes. This strategy is less appealing once you receive taxable Social Security benefits and even less so if RMDs subsequently push your tax rate higher at age 70½. Some "expiration dates" are firm but others are a function of declining health, depleted wealth, life expectancy, future interest rates or expected market returns, all of which are difficult or impossible to predict, i.e., they're risky. These are not factors that can be considered at the beginning of retirement and forgotten. They must be monitored and our plans revised as retirement progresses. While I generally believe it is wise to delay decisions until you have to make them, that is not the same as delaying decisions as long as you possibly can. Delaying a decision to spend home equity as long as you can is safer and more conservative, as is deciding to delay claiming Social Security benefits (safer, though not necessarily optimal). Delaying a decision to purchase LTC insurance or to do Roth conversions, on the other hand, may take these options off the table. It's important to understand which retirement funding options can be here today but gone tomorrow. Medicare Part B premiums are eating a growing percentage of Social Security benefits. A Bigger Bite Out of Social Security, Center for Retirement Research. Tom Morris, Wealth Management Advisor, Raleigh, NC. Retirement Planner: If You Change Your Mind, SSA.gov. Will Your Social Security Benefits Be Taxed? The Retirement Cafe´. See Table 1a, Annuitization and Asset Allocation, Milevsky and Young, 2007. Your Opening/Middle/End Game series has been extremely valuable to me--even caused me to revise my IPS to reflect these retirement stages. As always, your work is so very much appreciated!